Photos Copyright 1998, 1999, 2000 Eric M. Appleman/Democracy in Action. All rights reserved. 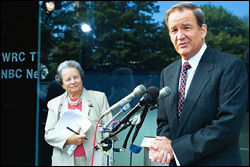 July 20, 2000--The Federal Election Commission having failed to act on the debates complaint he filed back in March, Pat Buchanan announces he is taking the matter to court. He said that to exclude him would be "discriminatory, outrageous and wrong." Buchanan's suit charges the FEC is failing to enforce regulations that govern the Commission on Presidential Debates; specifically, the suit argues the CPD is not non-partisan but bipartisan and that it is not using "pre-established objective criteria" but rather an arbitrary fifteen percent threshhold. Buchanan also spoke to the status of his campaign, stating that his objectives have been to get the nomination, secure the $12.5 million that goes to the nominee, and gain ballot access in the 50 states. He said he will run an intense campaign from Aug. 15 to Sept. 20, and particularly after Labor Day. "Timing is everything," Buchanan said. He said he has been down in his basement working on speeches and has five or six of them lined up and ready to go, but that the media would not pay attention if he delivered them now. He is also planning bus tours. July 16, 2000--After an appearance on CBS's "Face the Nation" it's off to CNN. Mr. Buchanan expressed confidence that he will secure the Reform Party nomination despite the challenge from John Hagelin. 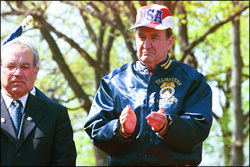 April 12, 2000--Pat Buchanan waits to speak at the Teamsters' rally against Permanent Normal Trade Relations (PNTR) with China. Thousands of Teamsters gathered in the area across from Teamsters headquarters, near the Capitol and listened to speakers including Harry Wu, a number of congressmen, and Buchanan. 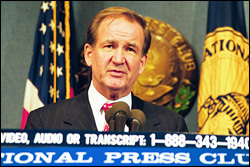 March 20, 2000--Pat Buchanan announces he is filing a complaint with the Federal Election Commission against the Commission on Presidential Debates. The complaint charged the CPD is "receiving and making illegal corporate contributions" and stated that its threshhold level of 15% required for participation in the debates has "no rational basis and is purely subjective." Instead, according to the complaint, the debates should include candidates who qualify for public funding in the general election. Nov. 12, 1999--Pat Buchanan receives the endorsement of Dr. Lenora Fulani, who heads a significant faction in the Reform Party. 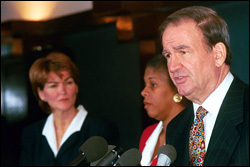 Fulani, a controversial figure on the left, acknowledged Buchanan has had "little connection to black America, to American progressivism" but said his candidacy "offers the black community the opportunity to join in new alliances." Fulani stated, "We are going to integrate that peasant army of his. We are going to bring black folks, Latino folks, gay folks and liberal folks into that army." She said, "I'm going to take Pat Buchanan to 125th Street in Harlem. We are going to have lunch at Sylvia's. I am going to take him to speak at Reverend Sharpton's National Action Network." Accepting Fulani's endorsement, Buchanan joked, "Welcome aboard. Your pitchfork has been assigned." Nov. 12, 1999--Pat Buchanan said Fulani's endorsement "opens a new page in this campaign and it sends a new message. And that is that this coalition is open to all..." "I think that this campaign is going to be a voice for the voiceless, and its objective is to give power to the powerless in America," Buchanan said. He stated that, "[T]he great goal of social justice is not being served in America today by this economy and the way it is functioning." "[T]he disparities in income in this country are becoming too great. They're becoming too outrageous, and that is not healthy," Buchanan said. Oct. 25, 1999--West Falls Church, VA. A balky sound system did not stop Pat Buchanan from leaving the Republican Party and joining the Reform Party. "Our two parties have become nothing but two wings of the same bird of prey. On foreign and trade policy, open borders and centralized power, our Beltway parties have become identical twins," Buchanan declared. Describing today's politics as "poisoned with rancor and hostility," Buchanan said that, "America needs a government of national unity and reconciliation that draws from the best of all parties." "I promise you: I will create that kind of government," he vowed. "And if we lead, they will follow, and if we build it, they will come," he said. [full speech]. Sept. 12, 1999--Still a Republican, but for how long? 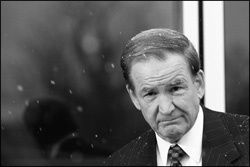 Pat Buchanan talks with reporters after an appearance on NBC's "Meet the Press." 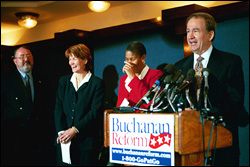 Buchanan told host Tim Russert that he could not commit to endorsing the Republican nominee. 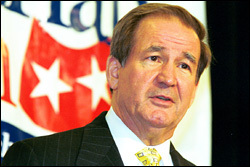 "I believe my party at the national level has become a Xerox copy, basically of the Democratic Party," Buchanan said. He said he would make a decision about leaving the Republican race and seeking the Reform Party nomination by October 15. June 1, 1999--Speaking to the National Press Club, Pat Buchanan sought to define the campaign as a contest between the "Establishment candidates"--Bush, McCain, Dole and Forbes--and himself. Specifically Buchanan noted that the four had endorsed Clinton's war on Serbia ("I am unalterably opposed. "), they support MFN for China, and they supported NAFTA, GATT, fast track trading authority, and U.S. entry into the World Trade Organization. On these and other issues, Buchanan declared, "Bush, Dole, McCain and Forbes are virtually xerox copies of Clinton and Gore." 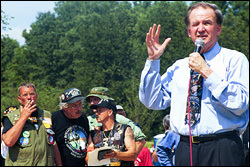 May 30, 1999--Pat Buchanan spoke at Rolling Thunder 12 on a very warm Sunday afternoon. Rolling Thunder, which began in 1988, seeks to draw attention to the POW/MIA issue. Tens of thousands of bikers from around the country proceeded from the Pentagon to the Vietnam Memorial, where some of them listened to music and speeches. 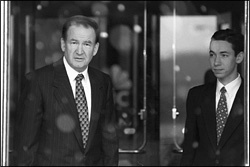 March 15, 1999--Pat Buchanan talks with reporters after appearing on NBC's "Meet the Press." The Wasington Post's David Broder joined host Tim Russert in questioning Buchanan for an ongoing "Meet the Contenders" series. Discussion started on the hot topic of the day, China and espionage. On abortion, Buchanan reaffirmed his commitment to the Republican Party but said he would leave if it ever ceased to be a pro-life party. 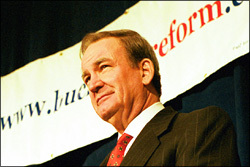 On immigration, Buchanan called for a moratorium or time out on legal immigration. On trade, he proposed a three-month moratorium on all steel imports and the introduction of a "very low recipricol tariff" on goods from Europe and Japan. Of his own appeal, Buchanan said, "I can bring home the voters of Wierton, West Virginia." "I don't know whether we can win the Jesse Jackson Democrats, but we can win back the Jesse Ventura Democrats," he said. 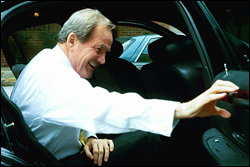 March 15, 1999--Pat Buchanan leaves NBC studios with an aide after doing "Meet the Press." April 8, 1998--Pat Buchanan greets an admirer while signing copies of his book The Great Betrayal, which examines U.S. trade policy, at Crown Books in McLean, Virginia. A long line of supporters and fans lined up to get Buchanan's signature and exchange a few words. 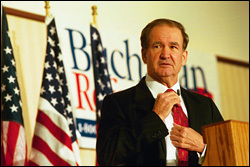 Asked about the possibility of another presidential run, Buchanan said, "We'll see."